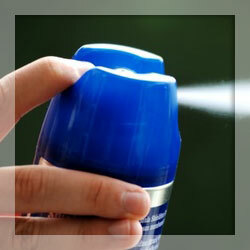 When spending large amounts of time outdoors, repellent sprays are an essential tool to keep insects from biting you. Insect bites can spread disease as well as leave an itchy rash. Repellent sprays are perfect for occasional use when spending an extended amount of time outdoors that would otherwise be unpleasant. Before choosing a repellent spray, make sure to consider different properties of each product and follow the directions carefully. Many insects are attracted to us through our smells, temperature, and movement. Our warm blood is perfect for insects like mosquitoes to get a meal for egg laying and nutrition. Popular chemicals such as DEET (chemical name N,N-diethyl-meta-toluamide) do not repel insects, but they rather make your body “invisible” or unattractive for biting insects. Repellent sprays are also created to work in short distances, so you might see insects such as mosquitoes flying nearby even though the product is working effectively. Some repellent sprays contain harmful chemicals. It’s important to follow directions carefully when applying doses on your body. If applied in excess, repellent sprays can cause serious illness. Some repellent sprays have sunscreens added to their recipes, however the spray should not be used instead of regular sunscreen. Only use repellent sprays as intended – to repel insects – and not as a means to replace other lotions such as sunscreen. When choosing the right repellent spray for you, make sure you choose the spray intended for the coverage you need. For instance, if ticks are the problematic insect in your area then make sure to use a spray that is specific for tick repellent. It is important to plan your trip outdoors and know which type of insects from which you will need protection. When applying repellent sprays, more is never better. As with any chemical dose for the body, the safest amount is the least amount that is most effective. Adding additional repellent spray will not increase insect protection after the maximized dosage has been applied. For instance, DEET applications are recommended at thirty percent or less. Another aspect to consider when applying repellent spray is how often you get bitten. Insects tend to gravitate towards certain body types. Children will likely get bitten more than adults, and people who sweat heavier than others will also attract a greater number of insects. Perfumes and cologne also tend to attract more insects, so when using repellent sprays limit any kind of usage with perfumes or cologne. Finally, it is recommended that any repellent spray you use is approved by local health governments. Your local health department will ensure that the chemicals listed on the label are safe for public consumption. They can also give you descriptions of any chemical that is not familiar on the label if you wish to research further. To fully enjoy your outdoor journey, choosing the right repellent spray will ensure insects will stay away and keep you from annoying bites. As long as repellent sprays are applied properly, you are guaranteed to keep nasty bites and itchiness away.